In this post I’ll explain exactly why the face pull is bad exercise and give you a safer, more effective alternative. Perhaps the most significant part of my work as an injury rehab specialist is not the exercises I put in people’s programmes, but rather the ones I take out. There are a number of common exercises that represent bad choices because their risk to benefit ratio is scewed in the wrong direction. Despite seeming relatively innocuous, face pulls are near the top of that list. Especially if you have existing shoulder problems. Firstly, what does the exercise feel like to you? Easy, easy, easy and then as the rope approaches your face, damn! Who lit the fire in my shoulders?! Don’t worry, you’re not alone. And physics can explain why. You’ll notice that to accommodate the width of your shoulders, you need to straighten the rope as you pull. This doesn’t sound like a big deal but it has a surprising effect. For every degree you take the rope into a wider triangle, there’s an increase in the force you’re having to produce to do so. Not only are you pulling the cable towards you, you’re also working to straighten the rope. By the time you get that rope to 120 degrees (almost straight), you’ve doubled the amount of resistance you’re working with. Go here for a detailed explanation of this effect. So if you’ve got 20 kgs on the weight stack, you are dealing with over 40 kgs by the time that rope nears your face. As you separate your elbows, the moment arm to your shoulder is also increasing, which means the resistance is too. To feel what I mean, try this. Set the cable at shoulder height and using a single cable handle, slowly pull the cable towards you. Keep your elbow at shoulder height and pull until you have a 90 degree angle at your elbow. The movement gets harder the closer the handle gets to you? Exactly. This is because the distance between the line of force (which is represented by the cable) and your shoulder (glenohumeral joint) is increasing as your elbow travels backwards. Is there anything else? Yep. Both the increasing moment arm and the additional force required to straighten the rope occur at the precisely the point where you are weakest, the shortest position of the muscles involved. These include the posterior deltoid, infraspinatus and teres minor. This is why it feels like somebody has put a blowtorch to your shoulders at the end of the range. It’s also why everybody performs this exercise fast, really fast. If you’re using a weight that is anywhere near challenging in the start position, the only way to get it to the finish position is to launch it. This creates a poor stimulus to the muscles you’re targeting as you bypass a significant part of their operating range. These big spikes in force also create the perfect conditions for injury. All in all it’s a poor exercise, with few if any redeeming features. A safer, more effective alternative. Presuming your goal is to get stronger and not injured, there are more effective alternatives. Firstly, by lying down you allow gravity to anchor your trunk. This will enable you to apply more force to the target muscles. The cable attachments above the elbow remove the contribution from the wrists and the elbow flexors / extensors. 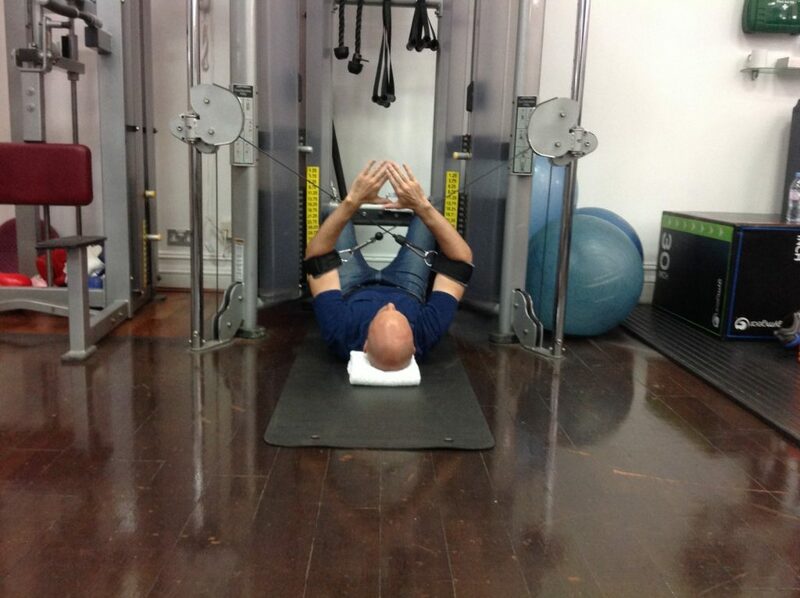 Again this allows a better stimulus to the posterior deltoid etc. This exercise also provides a more favourable resistance profile and will have those target muscles working harder throughout their range, not just at the end of it. Finish position (jazz hands optional). 1) Use cable attachments just above your elbow to remove your forearm and wrists from the exercise. 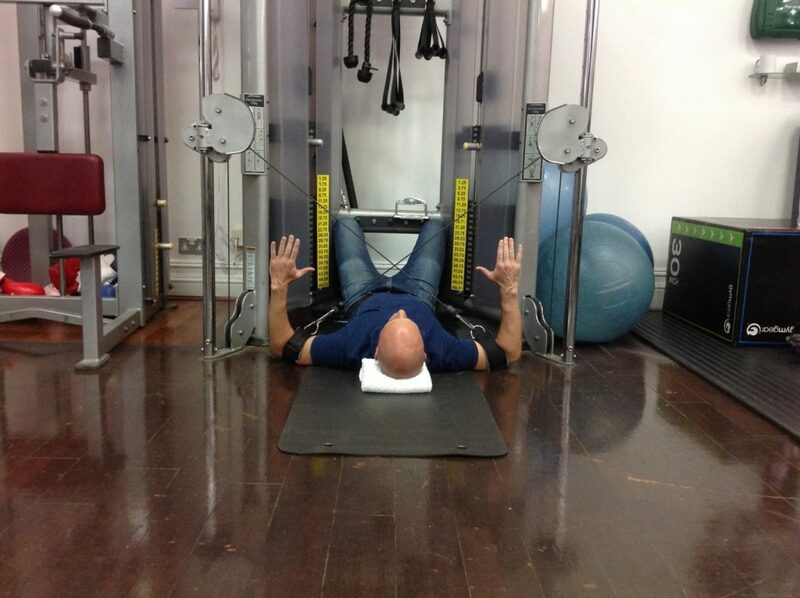 2) Lay down in the centre of the cable machine with your shoulders in line with its columns. 3) Set the cable height so there’s a significant drop off in the resistance as your elbows approach the floor (the cable should get closer to your shoulder in this position). 4) Measure how much active range of motion you have in the direction the cable will take your arm. Don’t let it take you further than this during the exercise. 5) Focus on taking your elbows as wide as possible as you push down towards the floor. Take a look around any gym and you’ll see people performing the same exercises as if there was no alternative. With a little knowledge of anatomy and an understanding of force, you’ll begin to see what a nonsense some of these exercises are. Listen to your body, if an exercise feels horrible it probably is. If you can’t adapt it, drop it altogether.